36 Port Washington Visitors Guide Bu si n ess D ir ec t o ry Dinner Theater Memories Ballroom 1077 Lake Dr., P.W., WI 53074 284-6850 Education Cardinal Stritch University College of Business & Management 6001 N. Yates Rd., #233, Milwaukee, WI 53217 414-410-4320 Community Learning Center 1234 W. Lincoln Ave., P.W., WI 53074 284-6502 Concordia University Wisconsin 12800 N. Lake Shore Dr., Mequon, WI 53097 243-4474 Milwaukee Area Technical College 5555 W. Highland Rd., Mequon, WI 53092 238-2205 Ozaukee Christian School 341 S. Dries St., Saukville, WI 53080 284-6980 Port Washington Catholic School 1802 N. Wisconsin St., P.W., WI 53074 284-2441 Port Washington - Saukville School Supt. 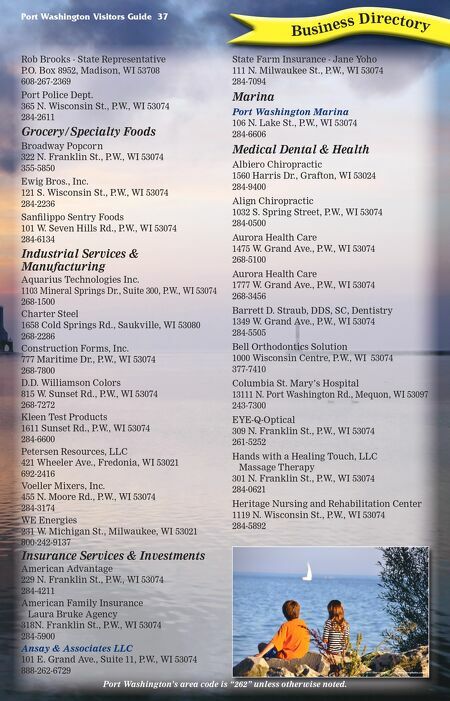 Office 100 W. Monroe, P.W., WI 53074 268-6005 Employment Services Portal Industries Inc. 1015 Cedar Creek Dr., Grafton, WI 53024 377-4410 SEEK, Inc. 1160 Opportunity Dr., Grafton, WI 53024 377-8888 Environmental Services Cans-To-Go, LLC 51 Oakland Ave., P.W., WI 53074 414-365-3600 Veolia ES Technical Solutions LLC 1275 Mineral Springs Dr., P.W., WI 53074 243-8900 Festivals Port Fish Day, Inc. PO Box 594, P.W., WI 53074 Fishing, Boating & Diving C & D Charters P.O. Box 616., P.W., WI 53074 414-840-1429 Cracker Jack Charters 5991 Hwy. 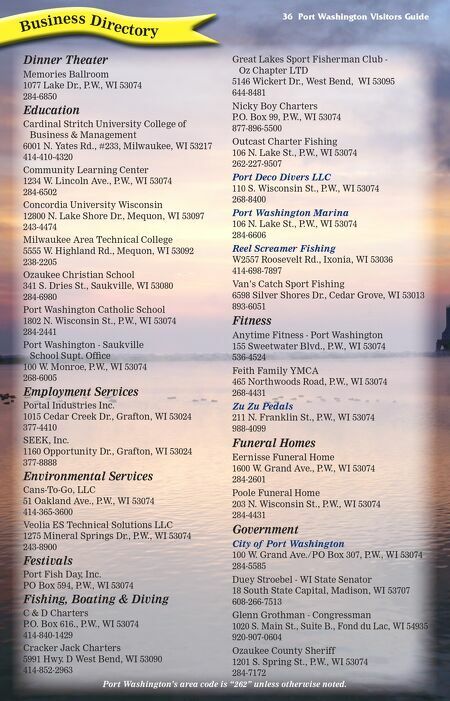 D West Bend, WI 53090 414-852-2963 Great Lakes Sport Fisherman Club - Oz Chapter LTD 5146 Wickert Dr., West Bend, WI 53095 644-8481 Nicky Boy Charters P.O. Box 99, P.W., WI 53074 877-896-5500 Outcast Charter Fishing 106 N. Lake St., P.W., WI 53074 262-227-9507 Port Deco Divers LLC 110 S. Wisconsin St., P.W., WI 53074 268-8400 Port Washington Marina 106 N. Lake St., P.W., WI 53074 284-6606 Reel Screamer Fishing W2557 Roosevelt Rd., Ixonia, WI 53036 414-698-7897 Van's Catch Sport Fishing 6598 Silver Shores Dr., Cedar Grove, WI 53013 893-6051 Fitness Anytime Fitness - Port Washington 155 Sweetwater Blvd., P.W., WI 53074 536-4524 Feith Family YMCA 465 Northwoods Road, P.W., WI 53074 268-4431 Zu Zu Pedals 211 N. Franklin St., P.W., WI 53074 988-4099 Funeral Homes Eernisse Funeral Home 1600 W. Grand Ave., P.W., WI 53074 284-2601 Poole Funeral Home 203 N. Wisconsin St., P.W., WI 53074 284-4431 Government City of Port Washington 100 W. Grand Ave./PO Box 307, P.W., WI 53074 284-5585 Duey Stroebel - WI State Senator 18 South State Capital, Madison, WI 53707 608-266-7513 Glenn Grothman - Congressman 1020 S. Main St., Suite B., Fond du Lac, WI 54935 920-907-0604 Ozaukee County Sheriff 1201 S. Spring St., P.W., WI 53074 284-7172 Port Washington's area code is "262" unless otherwise noted.